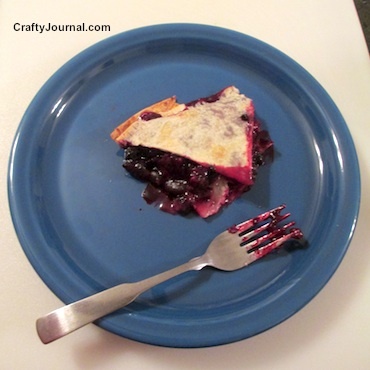 Sometimes I would love to have some blueberry pie, but I just don’t feel like making a pie crust. This is a quick way to make a blueberry pie because all you have to do is put the berries between 2 flour tortillas and bake it. How to Make Quick Blueberry Pie. 1. Rinse blueberries and remove the stems and the berries that are too soft. 2. Put the sugar and flour in a medium sized bowl and mix. 3. Add the blueberries to the bowl and sprinkle the lemon juice over them. Stir the blueberries into the flour and sugar mix until they are coated. 4. Lay one of the tortillas into the bottom of a deep pie pan (or an oven proof bowl, like I did). This allows the juice to bubble out without making a mess in your oven. 5. Pour the berries into the center of the tortilla, and add all the flour and sugar left in the bowl. Make sure there is about a half inch around the edge that is not covered by blueberries. 6. Wet the entire edge with a bit of water. Lay the second tortilla on top of the blueberries, and press the edges of the two tortillas together. Use a fork to press deeply all the way around the edge to seal it. 7. Cut some long vents in the top of the pie to release steam while the pie is cooking. 8. Bake at 400 degrees for 20 minutes. Poke a fork carefully through one of the steam vents to see if the berries are cooked. They will be soft when done. If the pie needs further cooking, turn the heat down to 375 degrees and cook for another 10 to 15 minutes. If there are any leftovers, it makes a great breakfast! I recently found gluten free tortillas and I am going to try this today. Thanks. Hi Janet, Were your gluten free tortillas corn tortillas? Or made from other flours? I’m glad to see gluten free is becoming easier to find. Yum! That looks amazing – and easy! I may try this one! Thanks for sharing. I came over on Grandma Ideas today. Oh, warm blueberries for a lot fewer calories!!! Very easy idea and sounds low in calories too, thanks for sharing it on Dream Create and Inspire. This looks super yummy! I love me some blueberries! Thank you for linking up with us at the Tips & Tricks Link Party!